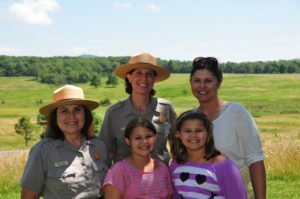 As I worked with our team for the American Latino Heritage Fund on researching the unique history and landscape of Shenandoah National Park we discovered an interesting rarity- a Latina National Park Ranger! Enedina Gasaway- Mexico-born mother of adult children- found her passion later in life in Shenandoah’s amazing environment. Introduced to the area and the National Park Service by her husband, Enedina pursued becoming a Park Ranger 15 years ago and has been working in one of the East Coast’s national treasures ever since. Throughout the 8-month season in the park, she provides bilingual guidance for families touring the area and many campgrounds as well as presents various park programs including native animal talks and hiking tours. 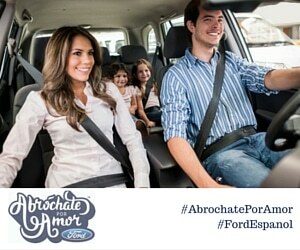 The moment we had an opportunity we switched into Español – a treat for us both. She told me that this job is perfecto for her when you think about the things she loved as a child growing up in Mexico and later in the western United States: chasing bugs and insects, playing outside, climbing, gardening, plants, and anything involving nature. Her colleague Kate Calais cites similar childhood experiences that lead her to a position with the Park Service following her collegiate studies. So NOTICE to all of you padres out there with outdoor enthusiastic daughters- let them explore! Saludos a todos! Hello to all and enjoy! My travel was partially sponsored by the presenters of the American Latino Heritage Road Trip: the American Latino Heritage Fund of the National Park Service. This entry was posted in Ideas, Travel and tagged chicos, familiy, kids, National Park Ranger, National Parks, padres, Shenandoah National Park, summer family travel, summer fun, tween travel, Tweens. Bookmark the permalink.